Moving to the Atlantic Coast or the Gulf? The come like an army. They don’t hide; they just trudge forward, immense, imposing and unavoidable. And then, when they arrive, all hell breaks loose, with jet-like winds and rushes of seawater that can flood entire regions. 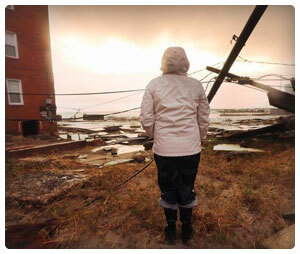 Hurricanes are some of the most daunting natural disasters in the world. Though they can be predicted days ahead of time, they can wipe out entire cities and destroy livelihoods. If you’re moving somewhere that experiences hurricane, you should know what to expect and how to prepare for them. Here’s our hurricane survival guide. Low-lying location – Low-lying areas often get flooded during hurricanes. Old infrastructure – If your home or immediate neighborhood seems like it might collapse under heavy strain, don’t chance it. Big-time hurricane – If we’re talking about a category 5 (scale 1-5), get out. Health- If you’re in poor health or have a physical ailment or disability, you shouldn’t brave the bear. Board up windows – Buy wooden boards to seal your windows, shutters and doors in place. Take down what hangs – Make sure any paintings, bookcases and other fall-able items are safely on the ground. Have a survival pack – Include a flashlight, food & water (5+ days worth), blankets, bandages, a radio, and a deck of cards. Stay inside – Don’t try to venture out into the hurricane unless your house falls apart.